I still haven’t seen Nil Battay Sannata. I know, it was touching and sweet and small and struck a cord in the audience. But I know that it exists, and it was a story about a mother and a daughter and nothing else fancy around it. No romance, no big songs, no stars. This movie is just a step up from that. A romance that is more about characters than fantasy, some fun songs that are cut a little short, and for stars, well, Ayushmann and Rajkummar Rao and Kriti aren’t really the biggest things going. But at least I know how to spell their names (I think, Rajkummar and his ms perplex me). But it keeps a sort of different feel to it, grounded and centered on the characters and the setting instead of commercial value, which I suspect lingers from Tiwari’s last film. What’s really interesting is that this film had a sold out theater. On the one side, it benefited from the sort of odd tone of a director coming from a combination of advertising and art films. And on the other side, it benefited from the failure of the major releases coming out around it. I mean, Toilet is still doing okay, but I wouldn’t be surprised if it dropped off this weekend. And of course Jab Harry Met Sejal (despite my massively popular posts on it) is terrible. There’s space for a small sweet film like this to flourish, to find an audience who might enjoy it and give it a chance. And thank goodness! Because we need more films like this. With interesting strong heroines, and complicated love triangles, and great character parts. The real outstanding entertaining part of this film is Rajkummar Rao. Who isn’t the hero and doesn’t even show up until well into the movie. But like Dharmendra in Guddi or Amitabh in Chupke Chupke or Pran in anything, he ends up being the most entertaining part. The thing that makes this film stand out, be a little different and a little better than it could be. 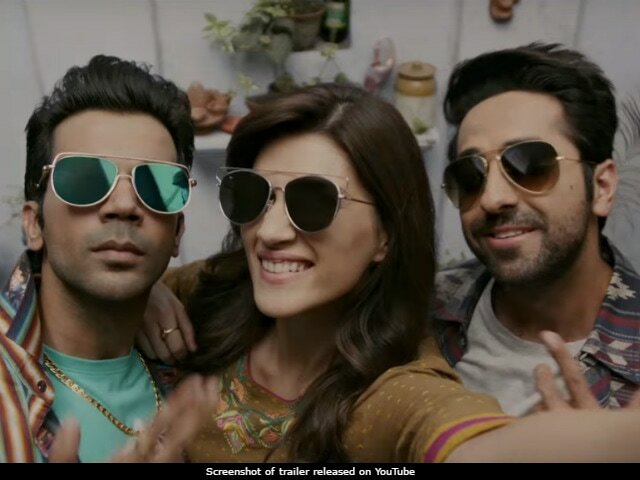 Rajkummar is the sprinkle on top, but Ayushmann and Kriti are the strong backbone of it. We have to care about their characters before we care about anything else in the film. And we do, they are real earnest people who just want to do the best they can and not hurt anyone. That’s what keeps us watching, and that’s what makes the ending touching. It’s a small low stakes story, and yet there were people tearing up all over the theater, because we cared about this characters so much, so much more than those smoothed out perfect type characters in other bigger budget films. I don’t think this film is something everyone will like. It’s definitely a romance, if you aren’t interested in that, you won’t like it. And it is very grounded in its particular setting, I don’t know if it will travel well outside of north India. The songs are fun, but short and not quite as good as they could be. The actors are good, but not huge stars and so on. The script is good, but there were a few minutes that fell a little flat. But for those who like it, it is exactly the sort of movie you have been waiting for. Kriti is a loving daughter with a good job and nice looks, but she is constantly turned down for engagements because she is too strong and outspoken and likes to roam around at night and drink and smoke. She can’t change herself, and doesn’t necessarily want to, but she also feels increasingly guilty for letting down her parents and sad for herself being so unloved. Until she picks up a cheap book at a bookstall, and the heroine is exactly like her, only the author thinks this is the best possible kind of woman. Ayushmann wrote the book, but made his cowardly friend Rajkummar Rao take the credit because he didn’t want to put his love story out there under his own name. It’s not based on Kriti, it is based on Ayushmann’s ex girlfriend from years ago. When he finds out Kriti wants to meet the author, he is curious, and agrees to take a letter from her to the author. They start exchanging letters, but also start hanging out in real life, and he falls in love with her. Only, she can’t move on until she meets the author. So he tracks down Rajkummar Rao and turns him into the kind of guy Kriti would hate, macho and bossy and rude. But it goes wrong, Rajkummar ends up winning over her parents, and he doesn’t want to leave town because he has fallen for her best friend. Ayushmann, to get rid of him, lies that he is divorced and destroys his own romance with the friend. In revenge, Rajkummar says he will win over and marry Kriti. And he does! Until finally, at the end, Ayushmann decides he will keep the secret, let Kriti marry Rajkummar since she seems so happy, and even writes a letter as Rajkummar to be read at the engagement because it will make Kriti happy. But Rajkummar loses his voice and asks Ayushmann to read it instead. And at the end, Kriti goes to embrace him and tells him SHE KNEW ALL ALONG!!!!! The first night, she ran into Rajkummar and he confessed everything. Ever since then, she has been testing Ayushmann, making sure he really truly loves her for her, not just because she reminds him of his ex. And all the rest of the characters were in on it too, trying to help these people find their way to each other. The trailers really do not sell this plot as it is. Which is what makes this promotion campaign so brilliant. They sell the love triangle, they sell Rajkummar Rao’s makeover, the sell a “different” kind of heroine. And they sell the idea that she finds the affirmation she always wanted in a book and wants to track down the author. But there is one very big thing they leave out, they leave out that Ayushmann actually is the author. From what we see in the trailer, it appears that Rajkummar was the author and loved her truly years ago. And Ayushmann meets her in real life while she is trying to find him, is approved of by her parents and all that, and decides to change Rajkummar so she will hate him and her parents will hate him. So there is a complicated love triangle, the sweet guy who loved her truly and wrote about her, and the guy who is right there in front of her in real life, who will she choose? Who do we want her to choose? But then you watch the movie, and it was never a question. Ayushmann and Kriti were fated to be together. He is both the guy she knows and likes in real life, and the guy who wrote a whole book about how his dream girl is just like her. Rajkummar is just there to be, well, Rajkummar Rao! Great actor, has a really fun time with this role, and adds something different to the film. Ayushmann and Kriti without him would still be in love, would still have their sweet love story. But the film wouldn’t really be memorable, Rajkummar is what makes it a little different. He’s different because he is extreme. In the hands of a less good actor, this would be a ridiculous character who breaks the reality of the film. A man so cowardly that he leaves town in fear before the book even comes out, not aware that it will be forgotten shortly and no one will read it. Who ends up working at a sari shop, terrified that his mother will find out his job isn’t as impressive as he said. But who, after a few lessons in being “badmaash”, completely changes personalities. And then changes back again later. And back and forth and back and forth. But Rajkummar makes it work! It isn’t just for plot purposes that he keeps shifting personalities. After he has been all gunda-fied, and met Kriti and her parents, he goes back to see his mother. Who immediately starts nagging at him. In public, when talking about him to Ayushmann, she was all supportive and proud. But now alone with him, she is needling and critical in a similar way to how Kriti’s mother is with her. It’s not that she is asking for little changes or improvements, she is criticizing the very essence of who he is. We can see why he leaped so quickly into this charade, he was delighted to unlock a part of himself that he was always afraid to show before, to find a way to stand up for himself. And we can see why he was friends with Ayushmann to begin with, someone strong who could show him a new part of life. We can even see why he goes along with helping Kriti and Ayushmann get together while Ayushmann is getting increasingly angry at him. He may enjoy this charade, but at heart he is still a good sweet guy and he doesn’t mind helping this friend who showed him a new way of being to find his own happy ending. But most importantly, there’s Kriti. She is where we start the film, being introduced to her as the girl who drinks a little and smokes a little and breakdances and watches English films without really understanding them. And being introduced with her identity crisis. She has been rejected over and over again. She is ready to give up, leave town, not expect anyone to ever love her for herself. And that’s when she finds Ayushmann’s book. It’s not that he is in love with her, it’s that he is someone in the world who could love someone like her. She isn’t unloveable, she just hasn’t found the right guy. And this is the thread that carries through to that crazy twist. She was “testing” him because she wanted to be really really sure he truly loved her for herself. Not just because she reminded him of someone else, but because of who she was. She is strong enough and wise enough to know what she wants and not be afraid to lose everything in a search for it. And that’s the other “twist” that isn’t in the trailer. She ISN’T Bareilly Ki Barfi, not at first. This isn’t a book about her, this is a book about someone like her written by someone who could love someone like her. It’s the start of their love story, not the end. The end of their love story is a lot more complicated than that. This entry was posted in Uncategorized and tagged Ayushmann Khuranna, Bareilly Ki Barfi, Krit Sonan, Rajkummar Rao, Valentine's Day by mredlich21. Bookmark the permalink. First of all I received your Christmas card and thanks a load for that,the mail came when I was not home,and my dad perplexed to find a mail from USA,had to open it and called me up (I was in office and papa is not the type to call me up over phone-usually it’s my ama.So he says- Avinash you got a Christmas card from shahrukh.I was like whaat,coz I had forgotten about the card and its February in India lol.. But once I saw it I remembered.I actually didn’t expect it to reach my home in Kerala.Mindblown..I was always a follower of your reviews, especially Malayalam movies.Lotsa love and prayers to you and your family mam.May you find happiness and keep on spreading the love. I am so glad you got the card! And of course I sent it, I said I would 🙂 Just takes a while. This was a nice watch and I loved everything about it except the lead heroine. The character itself is good but Kriti Sanon is just too posh looking to be taken as the rebellious small town girl. Her costuming helps but she’s still pretty & gori to be ever in the dire need of not finding a guy willing to marry her.I would have preferred someone like Kajol in this. Looks like she’s been typecast as small town now, her next two movies seem to have her in big Punjabi combined family situations. But hopefully a little less of a “no one will marry her” plot around it. I see where they were going with this movie, but I didn’t like it. I’ve watched it only once. Someday I may watch it again now that I know the “twist”, to see if it feels different. I didn’t interpret the relationship between Ayushmann (and his enabler friend) and Rajkummar quite as generously as you. I saw it as a quintessential outwardly strong (but actually insecure) person surrounding himself with weaker (as he perceives it) people whom he uses rather than has actual relationships with. A pattern I have seen over and over again in life. So, I could never root for Ayushmann and Kriti to get together, because eventually, in my experience, an Ayushmann-type would resent a Kriti-type for being an actually strong person and try to bring her down through daily emotional abuse, or split from her, find a more easily dominated woman to be with, and spend the rest of his life trying to ruin Kriti’s in small and large ways. No, it all makes sense. This kind of farce really survives on people being weak and scared for one reason or another, and too often it can drift into cruelty. On the other hand, if you haven’t seen it yet, I would recommend Shubh Mangal Saavdhan. It came out shortly after this movie so I always think of them as related. And Ayushmann in that is a very sweet and shy and kind character. I agree with you on this. Ayushmann’s character was so poorly written it was hard to root for him to win the girl. What saved the movie for me was Rajkummar and Pankaj Tripathi, especially the scene where Rajkummar fixes his neck and Pankaj says something like I can see all the way to the toilet now. They were fantastic. Ayshmann was a bully and not very appealing.